On Monday, September 24, 2018 the unique six-day conference was completed in the picturesque village of Fuzine, Croatia. More than 50 asylum seekers, including an international team of facilitators, humanitarian and faith-based activists from twelve countries, Egypt, Afghanistan, Iraq, Syria and Iran including, came together to wrestle with a number of burning questions that asylum seekers in Croatia and Europe are facing daily in their prolonged processes of waiting between interviews and issuing of the final government decision to their requests to stay permanently in Croatia. This dynamic and at times intense conference, with the theme “Moving Forward in Truth, with Courage and Hope,” represented the extension of the ROM – Renewing Our Minds international leadership project, and was organized by “Forum for Leadership and Reconciliation” (US), and “Business as Mission” (Zagreb, Croatia), in partnership with ECPM – European Christian Political Movement, from Brussels, Belgium. The conference was conducted in English, with simultaneous translations provided into Farsi and Arabic. The conference objectives included helping seekers of the international protection in Croatia, and those who have had their asylum statuses favorably resolved recently, gain a balanced understanding of the integration processes and related challenges in Croatia. Likewise, the conference organizers wanted to hear from the participating asylum seekers what are their most daring challenges as they are often waiting for two to three years, driven by uncertainty and anxiety, to have their requests answered by the Croatian Government? In short, the objectives of the conference were to help immigrants in Croatia and Europe to integrate well, and to help them grasp the essentials of European culture and Christian faith. The daily afternoon workshops helped the conference participants, most of whom were family men and women with children, to vocalize their most urging needs and anxieties. Some of the most frequent questions were: Why is the process of waiting to receive the final decision taking so long? Why are some asylum seekers, who have come to Croatia only recently receiving their positive answers sooner than those who entered Croatia two or three years ago, and are still waiting to have their cases finalized? Other questions included: While only a few asylum seekers have been allowed to work legally in Croatia, as they are waiting to have their asylum requests finalized, why are many more denied the privilege to work legally? Why is it that under the law some helpful privileges are promised to the waiting asylums seekers, such as learning the Croatian language and access to health care, while in practice those privileges are seldom accessible? Why is the Croatian government not helping reunite the families separated in different places and countries along their refugee trail? Through carefully selected lectures, and much time devoted to questions and group conversation, the organizers of the conference devoted their attention to the issues of law, culture and place of religion in the Croatian society; the three overlapping areas whose understanding is necessary if the Integration into the Croatian society is to be fully appreciated and implemented. Special attention was given to building of friendship and trust between Muslim and Christian asylum-seekers, as well as building friendship and trust between asylum seekers and the Croatian citizens and institutions. At the workshop about the role of faith and religious communities in Croatian it became obvious that the asylum seekers are expecting more empathy and support from the religious communities of Croatia than from the government. “Since it is in the nature of religious communities to care about vulnerable groups,” they reasoned, “religious organizations, churches and faith-based groups should be able to put in place a synchronized care network” that could efficiently help asylum seekers in the months and years of uncertainty and prolonged months and years of anxious waiting; and also help the asylum holders who have recently been granted the right to remain in Croatia. For example, they could help the new asylum holders, especially those with children, to find their first home and first job. The strength of this conference was that it dealt insightfully and compassionately with the challenges of integration as observed and handled by the three sides involved in the lives of asylum seekers: as they are handled by the Croatian and European laws and legal systems; as they are experienced by the asylum seekers themselves; and as they are addressed by the church and faith-based organizations and groups. Since most of the asylum seekers are spending long periods of time anxiously waiting for the final and affirming decision from the government, often being previously rejected two or three times, it became clear in the initial days of the conference that most of asylum seekers-in-waiting have suffered from the loss of trust in the Croatian government, its institutions and supporting agencies. The conference leadership team, which included also a group of asylum seekers and asylum holders, worked diligently to see the damaged trust and relationships healed and restored, and promised to contribute to the conversation by making the findings of the conference available to the public and relevant institutions. The quality of the conference was enhanced by the choice of speakers and facilitators, and experienced ROM (Renewing Our Minds) team members. Among them were Heather Staff, an emerging UK politician and Policy Adviser to Kate Green MP; Leo van Doesburg, Director for European Affairs for the European Christian Political Movement (ECPM); Amir Hekmatpour, spiritual advisor and faith mentor from the US; Donya and Shayan Spanta, asylum holders and humanitarian activists from Iran, now Croatian residents; Mihal Kreko, Christian pastor and humanitarian activist from Zagreb, Croatia; Tihomir Kukolja, Renewing Our Minds (ROM) Director; and Ana Šutalo, a representative of the Croatian Ministry of the Interior, and Asylum Support Expert. Ana Šutalo’s contribution to the conference was especially significant as she explained in detail what needed to happen once an asylum seeker has received a residential status in Croatia. Although the conference dealt with very serious themes and issues, often accompanied by heated but honest discussion, this event also became a festival of friendship through the relaxing, and spirit-lifting hours of sharing in the energetic feasts of music, dances, customs, culture of the countries represented at the conference, and moments of thanksgiving. However, the special feature of the conference were the moments that addressed the spiritual hunger manifest by all participants at the conference, Christians and Muslims alike. No hours were too long, and no optional workshops too many for the groups of participants who never ceased to ask new questions as they listened to Amir Hekmatpour, even in the hours outside his official speaking sessions. Amir Hekmatpour, from the US and with the origins from Iran, served as a spiritual adviser, mentor and speaker at the conference. “The results of this integration conference surpassed all our expectations” – stated Mihal Kreko, one of the organizers of the 2018 ROM Integration Conference, and the director of a unique integration project currently under construction in Zagreb, Croatia, known as “The House of Hope.” Heather Staff, a speaker at the conference and a UK politician commented: “I’ve never before experienced the level of honesty in our conversations as at this conference, and even when we disagreed we did it agreeably.” “The Thanksgiving Evening on the closing Sunday demonstrated that we all became one forgiving, forgiven and reconciled family of friends who loved each other. 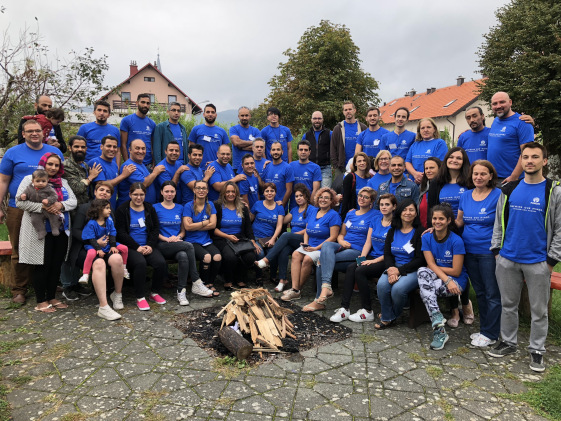 By the end of the conference one could see that the faces of asylum seekers radiated with new hope and new joy,” said Liviu Bocaniala, the conference music director. And Tihomir Kukolja, the ROM – Renewing Our Minds Director stated: “This conference opened my eyes. I learned more about the hardships of being an asylum seeker in six days of this conference than in previous three years”. At this time the organizers are involved in the speedy preparation of a memorandum that will be presented to the governmental and non-governmental organizations before the end of this month, as well as to a number of church and faith-based organizations in Croatia and abroad. This document will present in detail the conference’s objectives, conclusions and recommendations. It will be released in Croatian, English, Farsi and Arabic, and presented to several international organizations too. Tihomir Kukolja is director of ROM (Renewing Our Minds). This article originally appeared on the ROM website, and is reprinted here with permission. Image courtesy of ROM.